The fireworks continued in Natchitoches Monday night as the #1 ranked Chiefs squared off against the #3 ranked Spartans of Comeaux. Both teams started out slow, missing the first four shots of the game, until Calvin Carpenter hit a 3-pointer from the left corner to put to the Chiefs on the board. Adrian Remo caused a turnover and added another bucket for the Chiefs. After a timeout to adjust, the Spartans hit a field goal giving them two on the board with 3 minutes left in the first. Both teams continued to struggle on offense until Carpenter put up 2 with 1:45 on the clock. The Spartans answered with 2 of their own. The Chiefs’ Tre Solitaire inbounded the ball to Brain White and connected with 8 seconds left to tick away. Both teams picked up where they left off in the second, playing tough defense and keeping the scoreboard from changing. Remo opened with 2, and Carpenter and White contributed 5 each. Ferortay Banks and Devaughn Thomas of Comeaux added 6 to head into halftime 21-12 Chiefs. The third began with Comeaux scoring the first 6 to close the gap. Coach Micah Coleman addressed their turnovers and poor shot attempts and sparked a fire in the Chiefs. White led scoring in the third with 5, Carpenter added a 3-pointer and Remo dropped 2 in the net. Tony Preylo stepped in front of a Comeaux player early in the fourth to steal. He finished at the basket with a lay-up for 2. Comeaux brought in subs to try to break through the Chiefs defense to no avail. 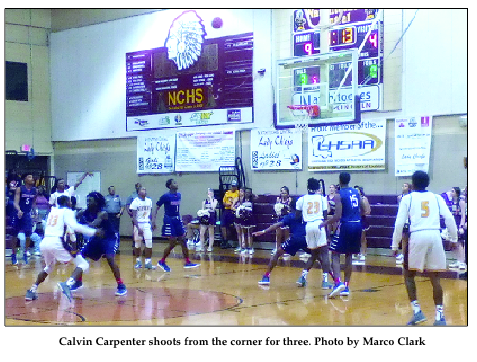 NCHS clamped down forcing Comeaux to take low percentage shots thereby ending their hopes of an upset in a 45-41 defeat. The Chiefs will be on the road at the Walk-Ons Invitational hosted by Tioga Dec. 5-9. Next articleFuture of Church Street Bridge; When, where and what are our options?